Left up to mainstream media, one would think that there is only one declared Democrat in the race for Marco Rubio’s U.S. Senate seat. In fact, it has been reported as such. There are some who want Floridians to think that Patrick Murphy is the only candidate that is in the race. Pam Keith is a delightful breath of fresh air in the staleness that is the Florida Democratic Party. She is an African-American woman who isn’t afraid to step out on faith, and belief, in herself. It is time for Democrats in Florida to do the same. The thought by the Florida Democratic Party that only a White male has a chance to win outside of predominantly African-American and Latino communities is actually disgusting, not to mention against what Democrats are supposed to represent. Have we forgotten about equality and equal opportunity for all? Pam Keith, the daughter of Kenton Keith, a U.S. Diplomat, has excellent credentials. After graduating from Boston College with her Juris Doctorate, Pam decided to serve her country, our country, in the U.S. Navy, as a Judge Advocate (Chief Lawyer). Pam volunteered to go to the Persian Gulf, specifically Bahrain, to serve as the Officer In Charge of the Legal Services office, where she received commendation. Upon separating from the U.S. Navy, Pam became a labor attorney for a Washington D.C. Firm, Morgan, Lewis, & Bockius. The fact that this woman is a decorated veteran, an accomplished attorney for labor, and is also on the Board of Directors for a non-profit organization that helps homeless and at-risk veterans, to me, outweighs the fact that she doesn’t come from, nor has access to, a vast amount of Republican money. To put it quite simply, she is one of us. She is a woman who has worked her way to where she is today. Nothing was given to her. The spoon in her mouth wasn’t silver, and her father didn’t hand over 5 million dollars in stock to her, like the other Democratic candidate in the race, Patrick Murphy. Don’t get me wrong, there is absolutely nothing wrong with being born into money and not having to really work for anything. Kudos to Patrick Murphy’s parents. They provided for him well. However, how does he relate to the majority of Democrats in this state? How could he possibly relate to you or me? If you served your country in the military, Patrick Murphy can’t relate to you on that level, because he never served. Pam can, because she has. If you have had to work hard for everything that you have today, and the position that you have today, Patrick Murphy can’t relate to you on that level, because he was born with that proverbial silver spoon and silver platter. Pam can, because she had to work hard to get where she is today. Pam speaks fluent Spanish and French. She can communicate with our Hispanic and Haitian brothers and sisters. Being a woman of color, we all know that she has had to be twice as good to get half as much. With the current #BlackLivesMatter campaign, what sealed the deal for me on Pam Keith, is what she did when no one was looking. Ironically enough, an incident occurred in Patrick Murphy’s district, to African-American canvassers who were canvassing for Patrick Murphy. After going to a house in his district to pass out “Murphy for Congress” literature, a 14 year-old African-American boy and a 16 year-old Haitian American girl were racially profiled and the North Palm Beach police were called about a “burglary in progress”. There was no burglary in progress. The 14 year-old Black boy and the 16 year-old Haitian American girl were helping the boy’s mother on their day off from school, who was at a separate house passing out Patrick Murphy literature, canvass the Murphy district. They were dressed in Patrick Murphy For Congress clothes. They were carrying Patrick Murphy For Congress Literature. They rang the doorbell. It was 7:30 in the evening. The children were surrounded by multiple police cars, and held against their will until the mother of the boy, who was canvassing at another house, could get to where they were surrounded by police officers. You see, the house was owned by a married police couple. The female half of the couple, who was home, was reported to have said she was going to the back of the house to retrieve her service revolver. In fact, these boys were told they were lucky they weren’t staring down the barrel of a gun. You mean like Michael Brown? Walter Scott? Trayvon Martin? It wasn’t the Murphy Campaign that came to those boys’ rescue, and went to Police Headquarters to lobby for their rights. Pam Keith let the police department know that what they did to those children, children that could have been yours or mine, was wrong. I don’t know about you, but I want someone representing me who is going to fight for my rights and my needs. There are 23.5 million African-American Women in this country and not one single African-American woman in the US Senate. To Patrick Murphy’s defense, he didn’t find out about the incident until later, accidentally, because campaign staffers decided that he shouldn’t be made aware of it. They didn’t want the campaign tarnished, because this occurred at the height of Ferguson and Michael Brown. The mother of one of the minor boys who was harassed, was told that she couldn’t mention this incident as a Murphy canvasser. Campaigns and Politics should never stand in the way of doing what is right, especially in today’s climate of Black boys and men being gunned down in the streets, only to receive no justice. No one was recording that incident, and it could have turned into yet another tragedy affecting not only the African-American community, but America. I want someone representing me who is going to speak up, speak out, and not be afraid of alienating anyone, while doing what is right. Clearly that is Pam Keith. She wasn’t related to those children. She didn’t have to advocate on their behalf. She did it because it was the right thing to do. She did it because she can relate to those of us who face these types of things on a regular basis. If Pam Keith will stand up for complete strangers who were canvassing on her now opponent’s canvassing team, she will stand up for you and I. If we keep deciding candidates can only run if they come from money, we will never get representatives in Washington that actually care, and understand, about the every day working person. I stand with Pam, and you should as well. Singularly, she can’t fight the Florida Democratic Party, that has told her she wasn’t good enough. Singularly, she can’t fight the political operatives pushing the thought that someone like Pam Keith, and thus someone like you and I, can’t win. Together, we can show them better than we can tell them. Today is Pam Keith’s “Give $20.16 for 2016” Friday Fundraiser. She is doing this the grassroots way, and isn’t betting on big donors and Corporations to give large amounts of money. She will only be beholden to you and I, the grassroots Democrats fighting for our rights. Leslie is the Founder of Women On The Move, and The Democratic African American Women Caucus, www.daawc.com. Follow her on social media for all exciting things concerning these two organizations. 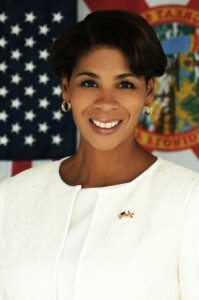 Pam Keith should attend the NOW Conference in Venice, Fl in May! great opportunity for exposure and get lady power out there to support her! Great idea! I’ll pass it on to her. Thanks! Hope YOU find this note. I have given Alan Grayson until noon on 6/1/ 2015 to announce or get out of the way for a real democrat. My personal problem with YOU is that you seem to like Patrick Murphy. YOU must be from his area of the country. I will be an Independent candidate on the November 8, 2016. I have run in over 10 offices and received up to 52,000 votes. I will spend my $7600 to stop Patrick Murphy. I want a consumer friendly candidate, at this point I have been friendly to L.A. Jones but it seems I cannot depend on her to be on the democratic primary ballot. If YOU have plans to quit let me know 386 788 3885. While YOU may win I am not convinced YOU can effectively challenge Patrick Murphy or Ron DeSantis …..seems you are just too nice of a person to be political. Pam Keith, please note I have updated my candidate status to run as democrat. I wish you the best, YOU just need to beat up on Patrick Murphy and who knows you could easily be the next democratic senator from Florida. If not continue running Bill Nelson will retire someday. It isn’t going to happen. She doesn’t meet the requirement. Too bad all of these people didn’t have this much passion in raising money for her! Hillsborough County Democratic Black Caucus Says “No Recommendation” To Lisa Montelione, HD 63! Chain Gang Charlie Is Back, Unfortunately For Black Folks In CD 13! Debbie Wasserman Schultz Will Do Anything To Stay Away From CD23!